​Thank you for your interest in New Milford Swim Club. We offer many different membership levels including full-time, weekday, weekend, single and senior memberships. For more information download our 2019 membership package. Payment plans available, please contact our membership coordinator at 201.265.5635 or email for more information. Discount on membership first year ($647 vs $731). Eligibly for election to the Board of Trustees. NOTE membership bond is a one time payment of $500. When a bonded member resigns their bond is refundable when a new bonded member joins. ​Current members who refer a NEW bonded member will receive 10 FREE guest passes, value $100. Refer a NEW unbonded member to receive 5 FREE guest passes value $50. Instant playdates - no arrangements necessary! Children and adults alike always find a friend to hang out with. Children of members can register for swim lessons at a discounted rate. Children of members can join our swim team for a nominal fee. $5 Tuesdays! Members can bring guest on Tuesday for $5 per person, discounted from $10 (max 4 guests at discounted rate). Remember! If your guest joins you are eligible for our member referral program! New Milford Swim Club provides an unsurpassable summer activity for member families and guests. 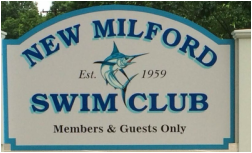 The rules, regulations and by-laws have been established for the protection and benefit of all members of the New Milford Swim Club, Inc., their families and their guests. It is every member's obligation to read and follow the rules and to ensure that their guests do the same. Click here to download a copy of the rules.